9" 4 pad 10 spline 1-1/8" hub heavy duty reman clutch disc for allis chalmers b, c, ca, d10, d12, d14, d15.B, C, CA, D10, D12, D14, D15 model engine(s). 9" 4 Pad 10 Spline 1-1/8" Hub Reman Clutch Disc For Allis Chalmers B, C, CA, D10, D12, D14, D15. 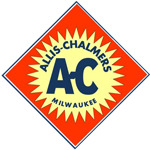 The Allis Chalmers B, C, CA, D10, D12, D14, D15 Series Tractors were also Manufactured with a 8-1/2" Clutch Please Check Size Before Ordering. There is a additional $20.00 Refundable Core Charge. Replaces Allis Chalmers PN#:70236122, 70236105, 70207784, 70236120, 70253187, 70232239, 70231976, 70230099, 70247744. Clutch Release Bearing For Allis Chalmers 190XT, 190XT III, B, C, CA, D10, D12, D14, D16, D17, D19, 180, 185, 190, 200. 9" Reman Clutch Kit For Allis Chalmers B, C, CA, D10, D12, D14, D15. 9" 6 Spring Reman Clutch Pressure Plate For Allis Chalmers B, C, CA, D10, D12, D14, D15.